Flannery, 16, lives with her charming but flaky mother in St. John’s, Newfoundland. Flannery says, “We used to be what’s called the working poor, but now we’re just plain old poor.” Her mother, Miranda, is an eco-artist, but that doesn’t qualify as work. She’s not paid. 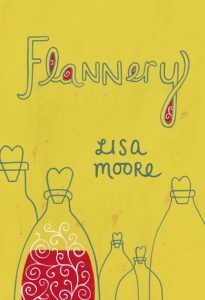 Both Flannery and Miranda are loveable characters in Lisa Moore’s “Flannery” (Groundwood 2016). As is a somewhat common theme in young adult literature, the precocious daughter is more responsible than her single mother. Miranda’s most recent major installation was an ice sculpture of a mama polar bear and her cub. She carved it with a chain saw and set it to sea to melt—her comment on global warming. Very cool, but, as Flannery points out, it doesn’t pay the bills. Starting in France, Flannery’s father was sailing around the world on a boat made of junk—outsized plastic containers, rusted refrigerator doors, found tarps—to protest the garbage that is abandoned on African beaches. He landed in Newfoundland on one wonderfully romantic night. But we don’t know his name, because Flannery doesn’t know it. Because Miranda never asked his name. So he doesn’t even know he’s a father. Flannery’s “voice” is fun, intriguing and remarkably authentic. It draws you in as you wait for the story to get going. Flannery has a little brother. She knows who the father is, but Hank has left them to marry a law student like himself. Flannery wants Miranda to tell the adorable, naughty, annoying Felix who his father is, but Miranda won’t. Flannery’s best friend, Amber, “drops” Flannery and stops competitive swimming all for an abusive boyfriend. Flannery is in love with bad boy Tyrone who is an outlaw graffiti artist. They’ve known each other since they were toddlers. Things look up for Flannery when their entrepreneurship teacher pairs her with Tyrone to do their final project. But Flannery ends up doing it alone since Tyrone neither comes to school nor answers her texts. But it’s Tyrone’s idea to sell love potions as their project. Flannery knows it’s a gag, but she’s going all out, having little bottles blown by a glass artist who’s on his way out of the country. The red “eternal love” potion is actually boiled beet water, the “crush” potion is spinach water, plus there are two others. Surprisingly, the potions seem to work. Power of suggestion? Best friend Amber is making a rock video of her boyfriend’s band for her entrepreneur project. He’s also her project partner. The boyfriend works to isolate and humiliate Amber. But Amber will not allow Flannery or anyone else to help her. There are lots of issues, which do indeed get tied together. You root for all these quirky characters through the many subplots. Not everything works out ideally for Flannery, but there are a lot of issues to hold the attention and respect of teens.